I feel like Columbo . . .
"Just one more thing . . ."
After writing the other day about 11/22/63, I realized how much it has in common with "The City on the Edge of Forever," an episode from the first season of Star Trek, first broadcast in April 1967. The original teleplay for "The City on the Edge of Forever" was written by Harlan Ellison, then adapted, rewritten, and/or revised by at least one other writer on the production team for the show. I have the Bantam Fotonovel adaptation here beside me. Mr. Ellison doesn't get any credit on the cover, but there is an interview with him on the inside. I'll come back to that in a minute. In 11/22/63, a man travels through a time-portal (located in the pantry of a diner in the ruins of his hometown) in an attempt to alter the past. He is successful in his mission, but the woman whom he loves in the past is killed, and the future is altered: the earth and everything he knew is threatened with destruction because of his meddling. He must then correct all of that. In his so doing, John F. Kennedy dies but the woman he loves lives on into the unaltered present. He loses her, but only to history. In "The City on the Edge of Forever," a man travels through a time-portal (located in the ruins of a city on a faraway planet) and unwittingly alters the past, thus altering the future: nothing that he knew came to be and his fellow space-travelers are stranded in time and space. Two other men follow him in an attempt to undo what he has done. One of those men, Captain Kirk, falls in love with a woman from the past, Edith Keeler. Like the love interest in 11/22/63, Edith is a social activist or reformer. Like Stephen King's female lead, she remains unmarried and turns her efforts at making a better world outward towards that world rather than inward towards a family. So Captain Kirk sets the past (and present) aright but loses the woman he loves, to death and to history. It is necessary that she die so that history can go on as it should or at least did. The mission is not to alter the past but to prevent the alteration of the past. Stephen King's protagonist, on the other hand, sets out to alter the past and to send history off in another direction. In so doing, he loses the woman he loves, but he also succeeds in his mission. The past, thus also the present, is altered. The problem is that the alteration, as in "The City on the Edge of Forever," results in disaster. In order to undo the disaster, the protagonist in Mr. King's novel decides to undo what he has done, but in the process, John F. Kennedy (one-half of the past's beloved) must die, just as Edith Keeler (all of the past's beloved) must die. The female lead in 11/22/63 (the other half, perhaps the lesser half, of the past's beloved) gets to live, although the protagonist still loses her to history. So McCoy plays the role of the meddler, the same role played by the protagonist in Stephen King's novel, while Kirk plays the role of History, also the role of the lover. Edith Keeler is the beloved, both the love interest for the protagonist and the young President who must die. Spock is simply the protagonist's friend, Al Templeton, who has recorded all of the facts and knows what has to be done. (Spock is also a miniature version of the Guardian of Forever who replays history on his tricorder, just as the Guardian replays it in the images projected upon the doorway to Forever.) Kirk decides to allow the woman he loves to be killed so that history can go on and certain disasters are avoided. (Others are brought about by his actions, but they were going to happen anyway.) Stephen King's protagonist, on the other hand, decides to allow the woman he loves to go on living--and loses her to history in the process. Also in the process, he allows history go on unaltered, thereby preventing disaster and destruction. Clear as mud, right? So who suffers the greater loss? Who makes the more heartbreaking decision? Who is more greatly affected? Who makes the greater moral choice? Captain Kirk or Stephen King's protagonist? By acting, Kirk allows the woman he loves to be killed. By not acting, the protagonist in 11/22/63 allows the woman he loves to go on living. One sacrifices the woman he loves up close and personal, while the other sacrifices the president whom he may or may not love (and then only from a distance), all so that history can go on as it should or did. None of this is to set up some sort of competition between "The City on the Edge of Forever" and 11/22/63, but it is getting me closer to my point. Sandra: Harlan. Why is "The City on the Edge of Forever" as well-loved as it seems to be by fans and critics alike? Harlan: Because it's a story about people. The underlying philosophical theme carries the plot forward, but essentially it's a very simple love story. A story of choice. The kind of story that is identified traditionally as "tragedy" in the grand sense. I don't mean that to sound pompous or even to suggest that it's literature--because after all, what we're talking about is still just a television segment--but it's the essence of human relationships that snares the viewer. It's what Faulkner intended when he spoke of the only thing really worth writing about being "the human heart in conflict with itself." I think those who like the show identify with that. That's what I was getting at the other day, for I think 11/22/63 lacks something of heart. (The protagonist himself admits that he is not a man who cries.) That's my opinion, of course; many reviewers and readers liked or even loved this book. Maybe to people of previous generations, losing John F. Kennedy to death was like losing a lover to the same spectre. To those of us born afterwards, however, his death, though tragic, is a piece of history. We will never know what things would have been like if he had lived. No amount of theorizing or speculation will make him live. More to what I think is the point of all the theorizing and speculation, whether in 11/22/63 by Stephen King or JFK by Oliver Stone (1991) or anywhere else, the Vietnam War will never be prevented. All of those men and women--58,220 of them--will still die. Their names (including that of a man named Terence Hanley) will be inscribed on a memorial to their sacrifices. Setting all of that aside, the loss of the love interest in 11/22/63, either to death or to the unaltered past, is not very affecting, to me at least--nothing like the loss of Edith Keeler. But maybe that's just another kind of nostalgia speaking in me. Who, though, has ever forgotten the scene in which Edith Keeler is killed, in which Doctor McCoy exclaims to an already grieving Captain Kirk, "Do you know what you just did? I could have saved her! ", and in which Mister Spock replies, with very human sympathy and understanding, "He knows, Doctor. He knows." As I mentioned above, the friend in 11/22/63--the friend who sends the protagonist on his mission--is named Al Templeton. I will now stretch his name beyond the breaking point: Al can easily become AI: artificial intelligence--a computer--a robot brain. Templeton is, literally, town of the temple. And what is the Guardian of Forever in "The City on the Edge of Forever" but an artificial (possibly) intelligence residing in a ruined city, with its columns, lintels, and pediments like a Greek temple? So is Al Templeton's name an homage to or evocation of the Guardian in his city on the edge of forever? And that's really all for now. 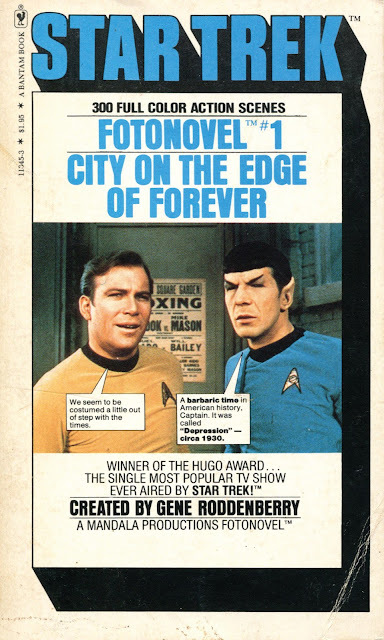 Star Trek Fotonovel #1, City on the Edge of Forever, by Harlan Ellison, even if he doesn't get any credit on the cover. Note the broadside for a boxing match in the background: in 11/22/63 by Stephen King, there is a fictional boxing match between a real and a made-up boxer. A note to everyone who scans and places images on the Internet: be sure to select "descreen" when scanning so as to avoid moiré effects in your images. I was in the middle of something when I last wrote, and I'm planning to pick up again where I left off. I would like to write about something simple before I get back to writing about something more complicated, though. The something simple is the time-travel, alternate-history, crime-drama, dystopian novel 11/22/63 by Stephen King, from 2011-2012. (I know, it doesn't sound simple, but it is.) I have read this book in the past couple of weeks, and I would like to write about it now in this month of anniversaries. One is the anniversary of the assassination of John F. Kennedy, the subject of Mr. King's book. The other is of the onset of the disease of Marxism-Leninism in 1917. Contrary to what you might think, these two anniversaries are linked. I think Stephen King knows that, but I'm not sure that he knows it all the way. The novel 11/22/63 is about a man who travels back in time to try to prevent the assassination of John F. Kennedy. It's a really intriguing concept, and in the first third of the novel, I was following right along and didn't want to put it down. You might be daunted by 849 pages of novel, but King is no Thomas Wolfe, and his book reads pretty easily. Too easily, I would say, and that's my first complaint. I have never been a big fan of Stephen King. That's not because I don't like his books but because I don't read his books. I'm generally not attracted to fat popular novels. (I have never read Clive Cussler and only one book by Tom Clancy. I shouldn't have bothered.) That's one of the reasons why I read Mr. King's mystery/crime novel The Colorado Kid, from 2005. It's short and to the point. It's also part of the Hard Case Crime line, which has a good reputation, despite its publication of books like Baby Moll by John Farris. (Please do not read this book. It's boring beyond belief.) Anyway, before I read 11/22/63, the only book by Stephen King I had ever read was The Colorado Kid. I enjoyed it, and I like the fact that it leaves the mystery unsolved, for the essential mystery is of the human heart, which is ultimately unsolvable. I found out later, too, that The Colorado Kid might offer some insight into the author himself and the life of his family, for Mr. King's father left them when Mr. King was a child and never came back, just as the title character of the book left his family and never went back. I enjoyed 11/22/63, but like I said, there are some things about it that bother me. One is the obvious shallowness of the narrator. I suppose there are people this shallow in the world, people who lack inner depths to probe and so do no probing. I'm skeptical of that idea, though, and I had hoped especially that the narrator, an English teacher and author, would not be so shallow. (In my first incarnation, I was, like more than one character on A Prairie Home Companion, an English major.) I can suspend my disbelief that a man can travel back in time and alter history. I'm less willing to suspend my disbelief that a man who was not so obsessed before would become obsessed with his five-year mission to prevent an assassination--that he would never flag, never doubt, never want to throw in the towel, never get lonely, never ask why he should do this thing or that he should do this thing, never question his mission, least of all, that he should wish to go on even when he meets and falls in love with a woman with whom he can live out a normal life in a normal place, if only he would surrender to that love and that life. The narrator's shallowness may have something to do with his apparent skepticism or agnosticism or outright non-belief in anything beyond the material, natural, scientific, or, perhaps most significantly, the historical. That mindset may or may not reflect Mr. King's. (I don't think it does.) But if a man loves and sees the person whom he loves as not just the biological means for perpetuating his selfish genes, then how can he go on being a materialist or a skeptic? I'm not sure. I will leave that question to the materialist or skeptic. Anyway, mark that up as another bothersome thing about 11/22/63: a not very likable or sympathetic narrator. Stephen King has contributed to Weird Tales (in 1984). So did John D. MacDonald (in 1949), a writer to whom the narrator of 11/22/63 refers more than once. That is significant, too, for Mr. King is, I think, a known admirer of John D. MacDonald, and in this book, Mr. King writes something along the lines of the man he admires. You might call the whole thing a salvage operation: something was taken from America and the world when President Kennedy was assassinated. The man who sends the narrator on his mission wants to get it back. And because the narrator is friends with the sender--his name is Al--he goes about his work out of amity and loyalty. The problem is that there was only one John D. MacDonald and only one Travis McGee. I could never quite believe that the narrator of 11/22/63 is up to the task at hand. If you have not read 11/22/63 and still want to, you should probably stop reading here. So just as in a case taken by Travis McGee, the salvage operation proves successful, but the woman is lost, in this case killed, as happens so often in MacDonald's color-coded novels. The narrator prevents the assassination, but in order to prevent the death of his beloved, he has to return to the present in order to start all over again. The novel takes a strange turn then, and very nearly loses it. What started out as a time-travel/alternate-history story and becomes in the middle a kind of crime drama turns out in the end to be a science fiction story of a dystopian future in which the portals of time are guarded by unknown people of--when? where? Because the narrator has prevented the assassination of the president, he has set the world spinning into a different timeline, and in that timeline, all kinds of terrible things have happened. (I get the sense that the narrator and the author behind him think of the election of George Wallace as president to be the worst of these things, never mind the earthquakes that have killed untold thousands.) In fact, the whole earth is threatened with destruction. In other words, John F. Kennedy had to die in order for the world not to be destroyed. In other words, the narrator, who discovers that there was no conspiracy to kill the president in the past, has come back to the present to find that there was after all a conspiracy. He doesn't recognize it, though, and neither, by appearances, does Stephen King. Put another way, neither believes in conspiracies carried out by assassins or agencies or governments, but both, especially Mr. King, seem to believe in conspiracies of history, that is, that history has to go a certain way and no other. History decided that John F. Kennedy had to die. And that's History with a capital "H," a curiously Marxist notion from a narrator and an author who want him not to have been assassinated by the Marxist Lee Harvey Oswald and who have done everything they can to prevent it. That brings me to the second anniversary in this month of anniversaries. One hundred years ago, in November 1917 (October by the old calendar), the Bolsheviks under V.I. Lenin overthrew the provisional government in Petrograd and instituted a murderous replacement based on the ideas of Karl Marx. Tens of millions of people died under that system in the ensuing century. In the eyes of any thoroughgoing Marxist, the killing of John F. Kennedy by a Marxist assassin must surely be one of the high points of a century of political murder and terror. Kennedy was, after all, opposed to Marxism and was one of the most fervent of cold warriors among all of our postwar presidents. He was also leader of a nation that represented the greatest foe and threat to communism. By Marxist rhetoric, Kennedy was a reactionary and a defender of the bourgeoisie. History commands that such people be overthrown, overthrown being a euphemism for murdered. In this anniversary year and month, apologists for and supporters of Marxism, communism, and other forms of socialism have celebrated the coming of the Bolsheviks. To them, it was a necessity--a historical necessity--that countless millions be ground under the iron heels of socialism. Today there are people among us who wish the same thing to happen again. One of them recently ran for president. Another is in control of the opposition in Great Britain. Tens of thousands more teach, study, and demonstrate on our college campuses. I don't know what Stephen King's politics might be beyond the Easterner's natural inclination to the left, but maybe he revealed something when he made Hillary Clinton president in his alternate history in 11/22/63. Believe what you want, but I would call that Dystopia. So, finally, another thing that bothered me about 11/22/63: In his coda, tacked on in 2012 to a novel published in 2011, Stephen King has his narrator meet the woman he loved in the past but knows him not in the unaltered present. She has lived a life of accomplishment, but it is accomplishment of a certain kind, what you might call the accomplishment of the activist, the social reformer, or even the collectivist. It is also accomplishment as defined by the current generation vs. accomplishment as people from Stephen King's generation and before might have defined it. (If I understand things correctly, the coda was suggested by Mr. King's son.) Unlike Stephen King, the woman from the past does not marry or have children. There is nothing interior, nothing directed towards a family. There is only the exterior and a turning away from family and towards this thing people call "society." In other words, her greatest love has been directed not towards family but towards "society," another curiously Marxist or leftist notion in a book that is ostensibly about love between a man and a woman. That orientation towards "society" may fulfill some people, but it strikes me as a kind of emptiness, an emptiness that concludes a book of essential emptiness. A good story, well told, with intrigue, excitement, and sensation, but in the end, like so much popular entertainment, empty.